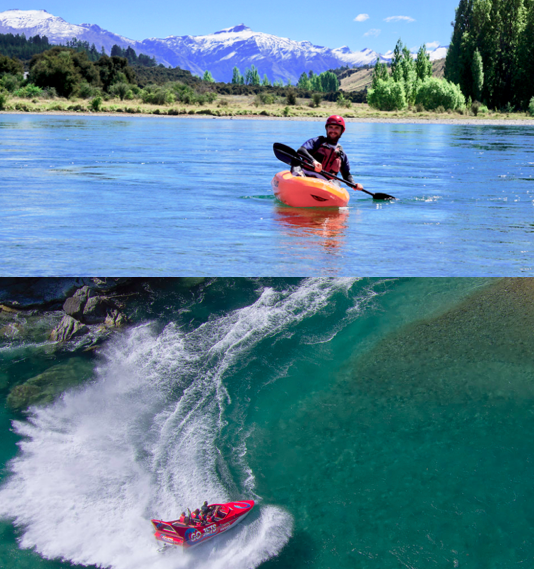 Experience the Clutha River two ways: up close & personal on a kayak, followed by a thrilling jet boat ride! Paddle Wanaka & Go Jets have teamed up to provide you with a unique Wanaka combo on New Zealands 2nd largest river! You'll begin this fun adventure with Paddle Wanaka where you'll be geared up & introduced to your friendly guide & your river kayak. You'll be fully briefed on river safety & how to read the flow of the water. Soon you'll be swifty moving along on this wide river with your qualified guide showing you all the playful spots. Pop in & out of eddys & ride a couple of the rapids whilst your surrounded by stunning scenery! When you reach the Albert Town Bridge, it's time for the team at Go Jets Wanaka to pick up the pace with the ultimate thrilling jet boat experience. Get ready for your adrenaline filled adventure down the crystal clear water, stopping to take photos of our world renowned scenery from the towering Southern Alps to our unique NZ bush whilst hearing all about the rich history of the region. The river flows swiftly through the valley between ancient glacial terraces, jet boating through the long section past the famous red bridge before reaching a rare switchback feature called the "Devils nook"
You'll finish up back at the familiar Albert Town Bridge, where you'll be transported back to Wanaka township.